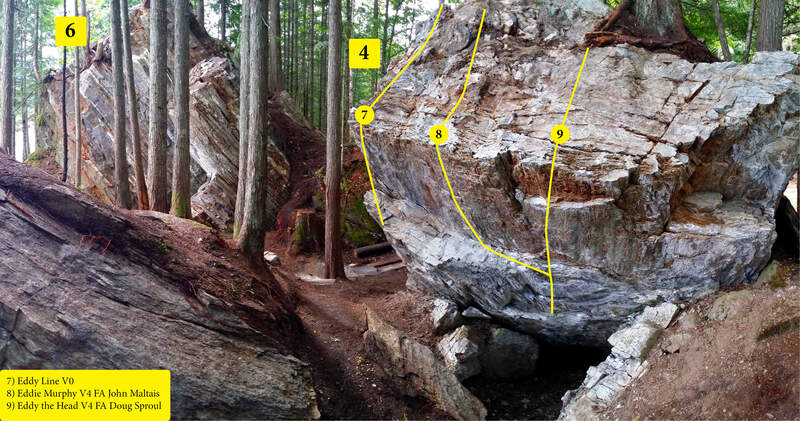 A bouldering zone two minutes from town, who knew! This small point jutting into the Columbia River had long been an unofficial dump and party spot, and it took the keen eyes of local developers David Sproule and Douglas Sproul to see past piles of garbage to the potential of the area. 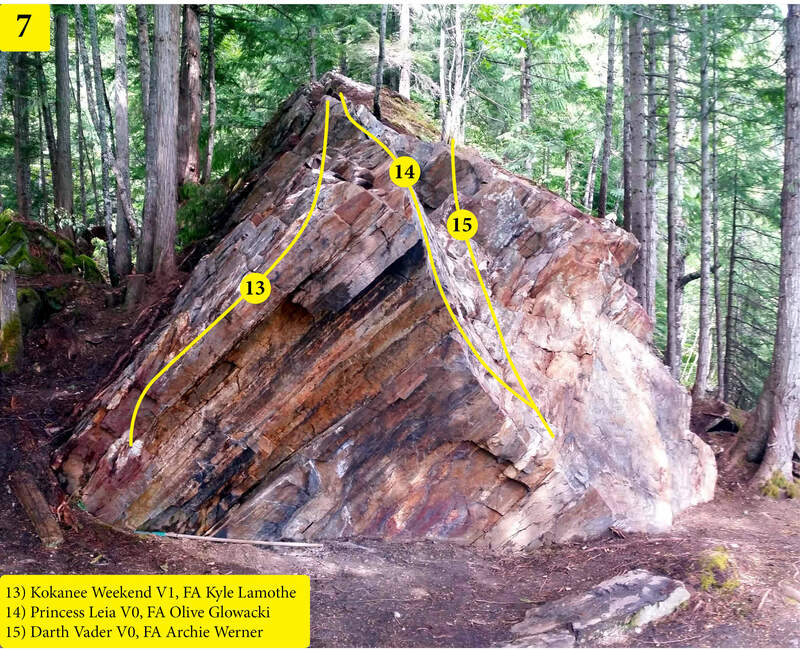 In the early summer of 2016, the newly formed Revelstoke Climbers Access Society (RCAS) with Dave and Doug at the helm decided to make a project of cleaning up and developing the area. 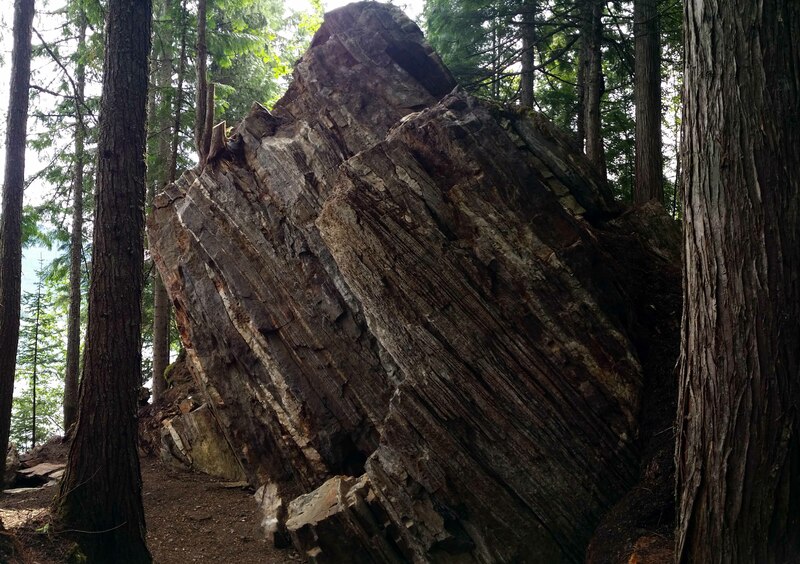 Countless trips to the real dump, many hours of buffing out trails and landings, and even five days of pressure washing, and the Big Eddy boulders were born! This area features great landings, zero approach, and a beautiful view of the river. 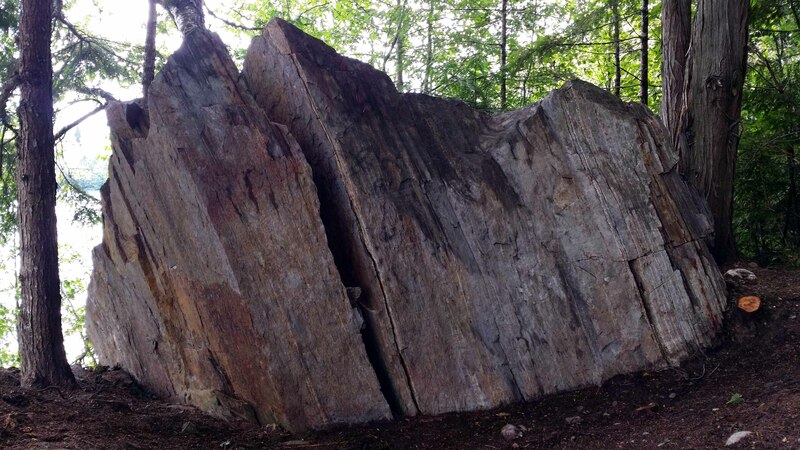 The lines are almost exclusively moderate, and although the rock quality is not the best in places, the Big Eddy boulders make a great place to bring children or beginner climbers. 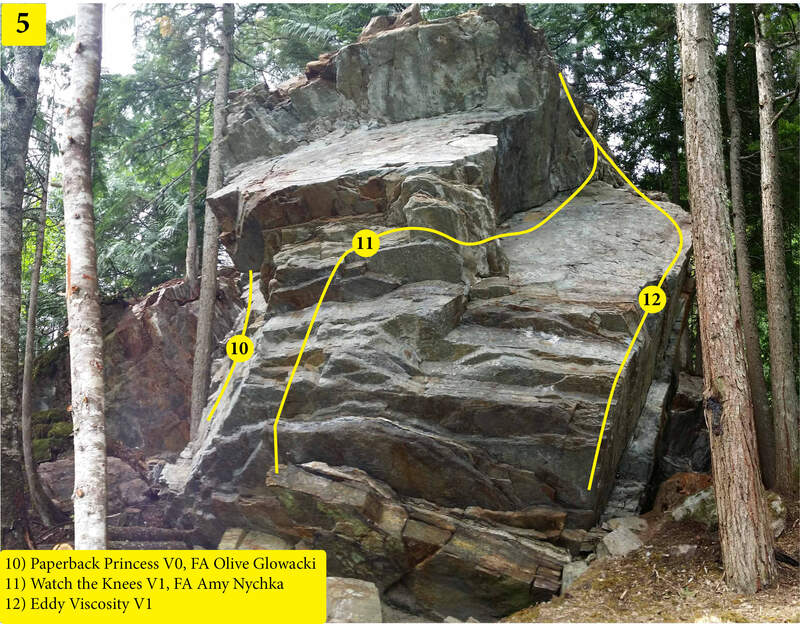 ​The developers request that the area is shared with the community in regards to first ascents and the naming of problems and boulders. So here's how it's going to work: first, check the images below to see if the line you're looking at has been recorded already. 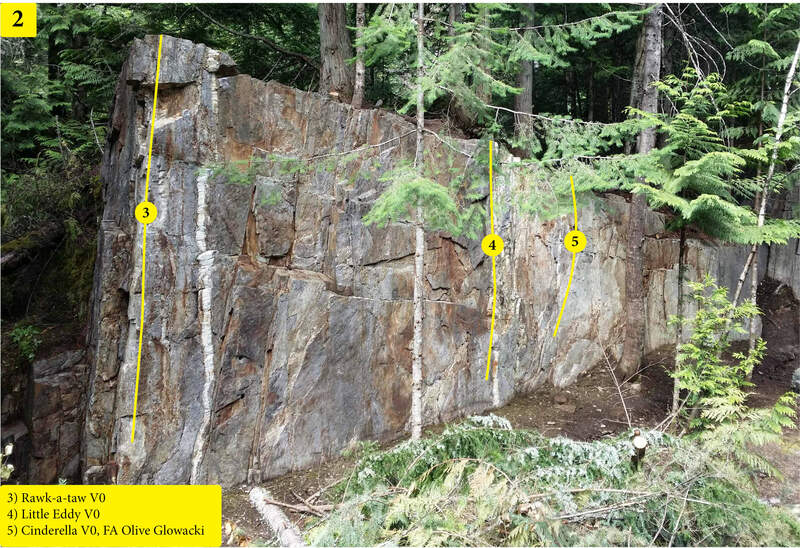 These pictures will be updated with new information as it comes in so you can assume they are up to date. 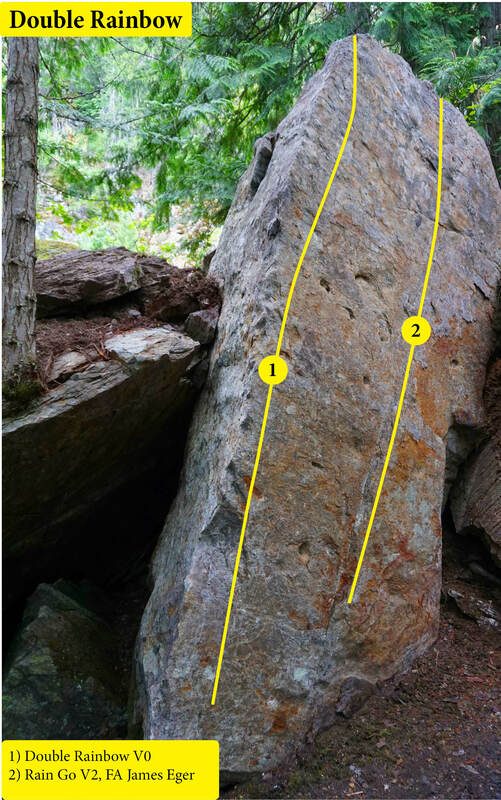 Next, if you have climbed a line that isn't shown and wish to get it in the topos, use the comment system below the image to provide a name, grade and description. If possible, please also download the image, draw your line on it, and email to back to [email protected] (I couldn't get a comment box that allowed pictures to be posted, so this is the best option). We'll get it in the system asap, and your shiney new FA will be shown in the images. We'll keep everything running this way until the majority of the lines are climbed and claimed, and then draw up the official pdf topo just like all the other areas.